Batman! Wonder Woman! Flash! Green Arrow! Harley Quinn! Superman! Joker! Medphyll?! Collect & Command your favorite DC Super Heroes and Super Villains in DC’s mobile exclusive Strategy RPG. Nekron and his legion of Manhunters have launched an all out invasion to destroy the DC Universe and fulfill the Blackest Night prophecy. 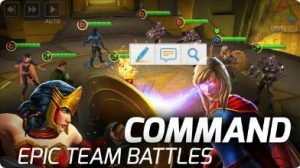 Collect and level up your unlikely team of Super Heroes & Super Villains to save the world in epic 4v4 combat! Evolve to unlock exclusive Legendary outfit, and powers for your heroes! Upgrade powerful gear for your hero, like Batman’s Batarang, Sinestro’s Power Battery, or Lex Luthor’s Kryptonite Ring! Join forces with friends in the all-new Alliance mode and chat system! Show off your winning strategy – Poison Ivy buff steals or Green Lantern energy shields? You decide!